We created nine trackball interactives for the Institute For Exploration that let visitors explore and enjoy the artifacts from a 4th Century B.C. shipwreck. The ship was on its way from Carthage to Ostia, the port city of Rome, when it got caught in a storm. 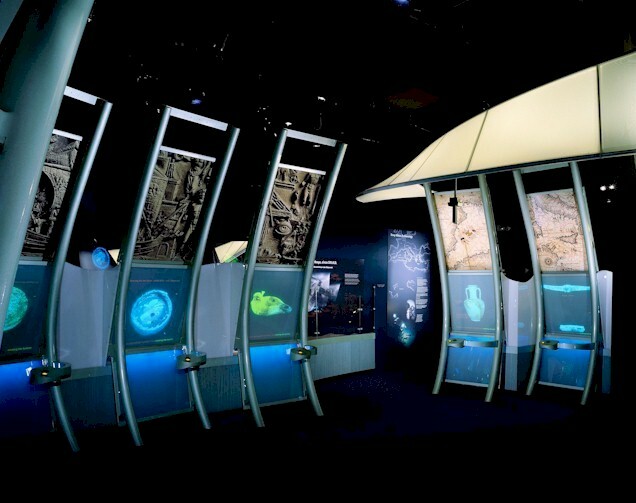 Physical kiosks feature 5' x 5' screens for exploration of artifacts. Each attract loop zooms in to a different artifact from the photomosaic of the shipwreck. The black and white photomosaic dissolves to a color beauty shot of the chosen artifact upon touching the trackball. As visitors roll the trackball over different parts of the artifact, popup text, graphics, audio and video help interpret that section. As a reward, after few minutes of exploration the screen magically goes clear revealing the actual physical artifact right behind the glass screen!